France surrendered to Nazi invaders and an armistice was signed June 22, 1940. 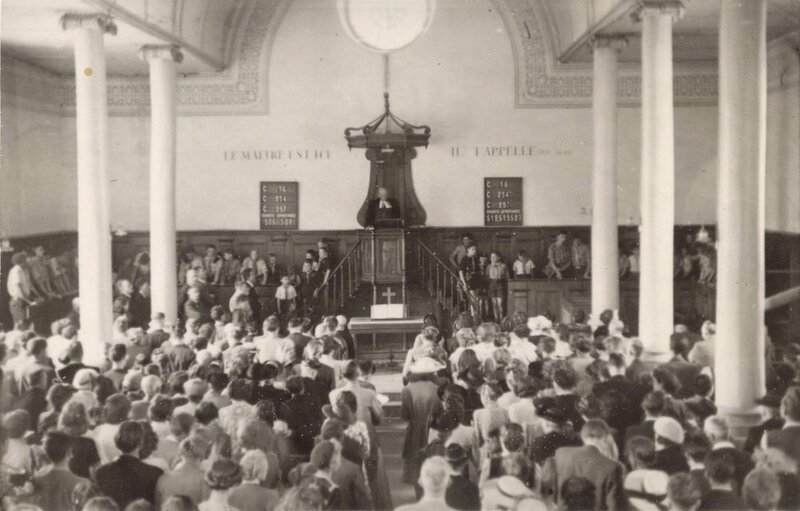 Presbyterian pastors André Trocmé and Edouard Theis wrote a joint declaration that Trocmé read as a sermon the next day in the Le Chambon church. Catherine Cambessédès recalls, “In the church you could have heard a pin drop. I was only fifteen, yet I clearly remember my mood going from lost and frightened to safe and calm. Can you imagine what a sermon like that meant to us at a time of fear and despair? To be told, in church, that if the military situation had changed, our source of inspiration had not: it was still to follow in the steps of Jesus and the New Testament. We were not lost. We still had direction. The day remains one of the most illuminating of my life” (A Good Place to Hide, 43). I invite you to step into that special moment and let these brief excerpts from that sermon illuminate, inspire, provide direction and calm for us as well. How do Theis and Trocmé speak to you and your community of faith today? In this call to Christian humility, brothers and sisters, we would like to add a few exhortations addressed to you in the name of our Lord Jesus Christ. First, let us abandon today all divisions among Christians, and all squabbles among the French people. Let us stop labeling ourselves and others, because that is the language of scorn: let us abandon right and left, peasants, workers, intellectuals, proletarians and plutocrats, all the terms we use to accuse each other of some wrongdoing or other. Let us learn to trust each other again, to receive each other, to welcome each other, reminding ourselves that every time we come together, like the early Christians, we are brothers and sisters in Christ. Then, having abandoned these suspicions and hatreds, and the political passions that go with them, let us gather resolutely around Jesus Christ, the head of the universal Church, and embrace his Gospel, and only his Gospel, as our source of inspiration, obedience and action. Finally, understand that the return to obedience obliges us to make some breaks: breaks with the world, and breaks with ways of living that we have accepted so far. We face powerful heathen pressures on ourselves and on our families, pressures to force us to cave in to this totalitarian ideology. If this ideology cannot immediately subjugate our souls, it will try, at the very least, to make us cave in with our bodies. The duty of Christians is to resist the violence directed at our consciences with the weapons of the spirit. We appeal to all our brothers in Christ to refuse to agree with or cooperate in violence, especially in the coming days when that violence is directed against the English people. To love, to forgive, to show kindness to our enemies, that is our duty. But we must do our duty without conceding defeat, without servility, without cowardice. We will resist when our enemies demand that we act in way that go against the teachings of the Gospel. We will resist without fear, without pride, and without hatred. But the moral resistance is not possible without a clean break from the selfishness that, for a long time, has ruled our lives. We face a period of suffering, perhaps even shortages of food. We have all more or less worshiped Mammon; we have all basked in the selfish comforts of our close family, in easy pleasure, in idle drinking. We will now be made to do without many things. We will be tempted to play our own selfish game, to cling on to what we have, to be better off than our brothers. Let us abandon, brothers and sisters, our pride and our egotism, our love of money and our faith in material possessions, and learn to trust God in Heaven, both today and tomorrow, to bring us our daily bread, and to share that bread with our brothers and sisters. May God free us from both worry and complacency. May he give us his peace, which nothing and nobody can take away from his children. May he comfort us in our sorrows and in all our trials. May he see fit to make each of us humble and faithful members of the Church of Jesus Christ, of the body of Christ, waiting for his kingdom of justice and love, where his will shall be done on earth as it is in heaven (A Good Place to Hide, 307-08). Lest Innocent Blood Be Shed, by Philip Hallie. I use this book in class. Love in a Time of Hate: The Story of Magda and André Trocmé and the Village that Said No to the Nazis, by Hanna Schott. Provides much more information on Magda and also their lives before and after the war. A Good Place to Hide, by Peter Grose. A broader, more carefully researched history than Lest Innocent Blood be Shed. It does not add much to the faith-oriented material of the other two books, but provides greater information on the actual activities of aiding refugees, includes surrounding towns, and includes stories of refugees. Weapons of the Spirit, a documentary that includes interviews with people from Le Chambon who lived there during the war. Posted on February 18, 2019 by Mark Baker. Seeds of this blog, part 2: Who should be given the low grade, the students or me? I advocate for following Paul--when exhorting include more indicative than imperative. I qualify this by saying that talking about Jesus as an example, although technically indicative, is not an indicative that undermines our tendency to experience ethical exhortation as bounded group religiosity. Yet, when I read the last batch of ethical exhortation assignments I found that most all their talk about God was God as an example. Then I had the thought, “maybe it is not them, maybe it is me; maybe I am the one who deserves the low grade. How can I explain this better?” Humbling, and even more humbling that it took me 20 years to see this. So, for students who have heard my lecture on offering exhortation in a centered, non-religious way, my apologies. Please consider this as an upgrade to one section of that lecture. Others, feel free to listen in. Hopefully if what I have said so far feels a bit foreign what follows will clarify. Because of human religious tendencies and because of their experience of bounded group religiosity, many people will experience commands in a religious way. The fuzzy solution to this is to avoid making imperative statements about things we are called to do. What is the centered alternative? How can we exhort people to action, give imperatives? In Religious No More I quoted Robert Hill who observed that, “Paul was ever answering the question of what we should do by saying something first about what God has done” (143). In more technical terms: Paul’s imperatives flow from his indicatives. Before defining those terms further it might be helpful to experience and feel the difference between an exhortation without indicatives and an exhortation rooted in an indicative of what God has done. Listen to these brief examples (3 minutes each). To speak or write in the indicative mode is to indicate or point. The vast majority of the Bible is indicative, giving information about God and humans. A common use of general indicatives in exhortation is to use God as an example. It is fine to do this; to, for instance, point to Jesus as model of loving enemies, but this type of indicative does nothing to undermine bounded group religiosity. Like any “naked” imperative, people easily hear it as an “ought” that they must comply with to meet the standard, to be in. Therefore, our exhortations must include other types of indicatives as well. of that reconciliation flow by reaching out to others. Linked indicatives and imperatives are not always short and in the same sentence. For instance, the first eleven chapters of Romans are indicative. Paul points to the reality of who God is, he describes the human reality of alienation from God, and he indicates how God has responded to that reality. After eleven chapters of the indicative mode he begins chapter twelve by saying “Therefore.” Based on what he has indicated and pointed to he now turns to discuss ethical actions—imperatives linked to the previous 11 chapters of indicative. It is not just: God or Jesus show us what love is, but God’s love enables us to love. As I describe in chapter two of Religious No More Jacques Ellul portrays religion with an upward arrow ↑ because our natural tendency is to think we must do things to earn God’s acceptance. Ellul uses a downward arrow ↓ to communicate that Christian revelation, the God of the Bible, is the opposite. Any indicative statement that points to the primacy of God’s loving action, even if not linked to an imperative, challenges our religious tendency and reinforces the gospel ↓ arrow. Therefore, in an exhortation, statements about God’s unconditional love and grace help prevent people from experiencing the command as bounded group judgmentalism. Let us, as we prepare Bible studies, sermons, and classes ask the question: What am I doing in this exhortation to undermine the default arrow ↑ of religion and to prevent people from hearing what I am saying as bounded group religiosity? In response to that question, quantity matters. Take note, in Romans Paul has 11 indicative chapters before four chapters of ethical exhortation and ends the letter with indicative words. In Galatians after four and a half chapters of indicative Paul turns to the imperative mode in chapters five and six, and then ends with religion-undermining-indicatives. Why does quantity matter? Because of our natural religious tendency, one short statement of God’s grace is not enough to overcome it. Many sermons are the opposite of Paul. They speak much more about what humans ought to be doing than about what God has done. Paul spoke first about what God has done and spoke much more about what God has done. Let us follow Paul’s example! Use linked-indicatives, empowering-indicatives, religion-undermining-indicatives—and use more indicatives than imperatives. See the ethical exhortation section of the Discipleship and Ethics website for exemplars of exhortations that use the above types of indicatives well. Posted on January 9, 2019 by Mark Baker. You have seen it: a group of friends together at a table, but all looking down at their phones; a couple taking a walk and each talking on a phone; or a family eating together but repeatedly one or another turning aside to respond to a text. Is this the picture of peace? “Shalom,” is one of my favorite words. The Hebrew word is so much richer than our English word “peace.” It means not just absence of conflict, but the presence of harmony and well-being. Mobile devices connect us to someone or something far away but disconnect us from the person next to us. This is not shalom. Advent is preparation for presence. John the Baptist, in the flesh, prepares the way for God incarnate—Jesus. God did not send a text; God came to be present and live amongst us. Ours is an age of absence. We sit in the artificial light of screens of all sizes, yet in terms of relationship we too often sit in darkness—absent even from those close at hand. How might you prepare the way for presence this Advent? How might you be more present to yourself, to God, to others? Might you experience more shalom through taking a Sabbath from your phone? Through setting times away from all screens? Through covenanting to be present with others and putting your mobile devices aside? Jesus may we experience the richness of your presence and may we be present to others so lacking in shalom in this age of absence. Posted on December 7, 2018 by Mark Baker. On Friday afternoon I led a Bible study with a circle of men in the Fresno County Jail. It included entering the biblical story ourselves and experiencing Jesus countering voices of shame we hear. I passionately invited them to imagine Jesus’ loving gaze when they hear shaming voices. One way or another, I address shame about once a month in the jail Bible study. Why so often? Inequality feeds violence. James Gilligan, a psychiatrist who served as director of mental health for the Massachusetts prison system, explains that dividing people into categories of superior and inferior feeds violence. He states that as societal inequality increases so does violence. In a previous blog and in a section of this website, I have summarized research that shows that many problems, not just violence, increase with inequality—and everyone is affected, not just the poor. Why? Why does greater inequality feed these problems? Gilligan’s writing on violence powerfully displays the answer. At the root of violence, he found shame; and increased inequality is a catalyst for shame. My friend, and sociologist, Bob Brenneman found the same thing in his research on why people join gangs in Central America. There are a number of contributing factors, but the one that stood out was shame. Therefore, as we work for shalom, two key things to pursue are lessening inequality and healing shame. The men in the Bible study come from a high security pod. Most are gang members. Violence is a part of their past, if not their present. What would Gilligan’s and Brenneman’s books tell me? If I dig beneath the tattoos and the criminal records what will I find? Shame. Therefore, I frequently proclaim liberation from shame through Jesus. That Friday, after doing the shame-healing exercise we had a time of prayer. I invited them to speak the names of people they love who have needs that the inmates themselves cannot address or solve. By naming them we would be asking God to bless them and do what we are unable to do. After the correctional officer took the men back to their pod he came to unlock the closet where I turn in my report on how many attended. He asked me, “How were they?” From time to time a C.O. asks me a “how did it go?” question that feels supportive, interested. This felt different. I replied, “Fine, it was a good study. They engaged well. They treat me well. Thanked me for coming.” All he said in reply was, “they are the worst of the worst.” I assume he was making a general comment about them coming from one of two high-security pods in the building. I guess on paper, if you look at the number of past infractions, and assume that tells you who they are—then yes, “worst of the worst.” But the words shocked me. I did an internal double-take. “What did he just say?” Is he talking about the same men who just lovingly prayed for others? Who thanked me for coming? Yes, they acknowledge they have done bad things in the past, but they long for a chance to live differently and not be defined by their past. As I rode home on my bike I pondered those words, “worst of the worst.” How does that categorization seep out through the words, the looks, the actions of that C. O. and shower the men with shame? What does it do to the men to wear that label? If Gilligan is correct, that correctional officer and the shaming system he is a part of will increase, not decrease the level of violence in society. I do Bible studies to counter shaming voices frequently . . . perhaps not frequently enough. He has worked in the jail and before that prisons, for years. This week I heard him say to another. C.O. that he had not had a break all day. I asked him why. He said, “A couple of the other guys working are new. I can’t leave them alone. The men would eat them alive.” (I assume he meant take advantage of them.) He is not naïve, but unlike the other C. O. he works with intentionality to lessen shame. He refuses to divide them into an inferior category. Which of these two men represents more accurately the system as a whole, society as a whole? Sarah Koenig, of the Serial podcast, has spent months interacting with people in Cleveland’s criminal justice system. How would she answer the question? I listened to the first episode of season three while working in our garden. Her words near the end of the episode led me to put down my spade and, through the lens Gilligan’s work, sadly ponder the implications of what she said. A felony judge I was talking to for a different story in this series told me he was thinking of giving a defendant serious time. “What's serious time?” I asked. He explained, well, to someone with common sense, even one day in jail is devastating, life changing. To someone who's got no common sense, maybe they do three years, five years. Means nothing. They go right back out and commit more crimes. I knew what he meant. Punishment is relative. What it takes to teach you a lesson depends on what you're used to. But there was a more disturbing implication as well. One that prowls this courthouse and throughout our criminal justice system. That we are not like them. The ones we arrest and punish, the ones with the stink, they're slightly different species, with senses dulled and toughened. They don't feel pain or sorrow or joy or freedom or the loss of freedom the same way you or I would. “We are not like them.” What a potent shaming mechanism prowling through our justice system and society. To be an agent of peace is not just to defuse and de-escalate a situation of active violence. It is also to work at the root causes of violence. James Gilligan would tell us that includes lessening the inequality gap, alleviating shame and building dignity. Clearly Jesus knew this before Gilligan. Whereas the first Correctional Officer’s words sound like things we hear from the Pharisees, Jesus’ words and actions match and go beyond those of the second officer. What are ways we as individuals contribute to making distinctions between superior and inferior? What are ways our church communities do that? How do we participate in and go along with ways society builds the inequality gap? What actions can we take toward dismantling or transforming systems that contribute to the inequality gap? How can we follow Jesus in alleviating shame and restoring dignity? What are ways we can lead the shamed to experience Jesus’s loving embrace? Posted on October 17, 2018 by Mark Baker. Who is someone you have thought critically of today? A person or two you have looked at with disdain or disapproval this week? I invite you, pray a blessing on those people. What happens (to you)? Years ago, I thought critically of the pastor of the church I attended. He was a good orator, but often appeared to make up the sermon as he delivered it. He led us in making plans, but not in carrying them out. I could go on, but the point is I had a list of critical thoughts about him. I brought them to church with me each week. Seeing him through the filter of that list made it hard for me to see anything else about him. I had a hyper-sensitive radar to his negative attributes. It was a critical feedback loop. My growing disdain and frustration became a barrier to experiencing positive things that he and the church had to offer and also a barrier to my involvement in the church. My friend and mentor, Doug Frank, suggested that each week at church I imagine the vulnerable hurting little boy within the pastor. (Just as Doug had previously led me to think of the little Mark Baker within me.) What happened? I still had critiques of things the pastor did or did not do, but the starting point was compassion. The filter changed. I saw him differently. How might it change our days if we wrapped every thought about another person in a blanket of blessing and compassion? How might it change our interactions if blessing and compassion were our starting points? How might that help us live out a centered approach to church? I will say more on that in a moment, but first a few thoughts about God. How might it change our concept of God, our experience of the God we live with, if we knew, in the depth of our being, that God looks at us through eyes of blessing and compassion? For many, to hear the words, “God sees into the innermost parts of your being” provokes fear. If the peering eyes are unkindly ones, the fear is appropriate. Roberta Bondi, in her memoir, Memories of God: Theological Reflections on a Life (great book!) describes a turning point in her relationship with God and Christianity. Through reading one of the early desert monastics she realized, “that only God can judge us because it is only God who can look with compassion on the depth and variety of our individual experience and our suffering, and know us as we really are” (78). God looks at you with eyes of compassion. Rest in that thought for a moment. Imagine Jesus looking at you—looking not just at your actions, but probing with understanding at the roots of those actions. Having the God revealed by Jesus, the God described by Bondi, at the center is a key element in the difference between the character of a centered church and a bounded church. It is not, however, just because of how it changes an individual’s experience of God. Emphasizing relationship with the center includes the biblical imperative of seeking to live in conformity with the center, to imitate Christ. Deepening relationship with Jesus calls and enables us to view others with compassion. That too will change the character of a church. Would you like to be part of a church community filled with people like I was with their radar set to highest sensitivity for others’ shortcomings, or with people like Doug Frank who look at others with eyes of compassion? A critical posture feeds a bounded approach. Looking critically at others enables me to feel a sense of superiority. Even if not done consciously, it is an over-and-above move. What happened when I looked at the pastor through different lenses? Thinking compassionately about his hurts and wounds was a leveling move. It was not pity; I too carry wounds. It put his actions that I was critical of in a new light and led to different thoughts about what might bring change in his life. How about fuzzy? Note that Bondi does not say that the turning point was realizing God does not judge. Doug did not suggest I ignore the pastor’s shortcomings. Experiencing tolerance feels better than a critical unkindly eye, but tolerance is also less than blessing. A fuzzy approach could compassionately understand why a person acts as they do, but would stop there. It would be hesitant to take the next step. It would not seek to use that understanding to work with the person for change. Is that full compassion? Is that naming? Let us look at others with eyes of compassion and prayers of blessing. Posted on September 21, 2018 by Mark Baker. Karen and Keith also live in New York City. They own a house worth over $1.2 million. Their household income is over $300,000. They do not own a second house, and their children go to public school. Although significantly less affluent than Ursula, they viewed themselves as privileged. Karen said, “We’re both horrified by how much money we make.” Keith, talking about their house said, “My feeling is it’s a bottomless pit, renovation and home improvement. And I think that six Chinese people are camping out in some one-bedroom hovel in Beijing right now. So, like, the notion that you ‘need’ something is all BS” (29). How is it that the family with significantly more wealth does not see themselves as “privileged” and view their lifestyle as extreme as Karen and Keith do? Rachel Sherman, a sociologist, interviewed 50 people from 42 New York City households—all earning more than $250,000 a year. She repeatedly heard perspectives similar to both views above. In the first chapter of her book, Uneasy Street: The Anxieties of Affluence, Sherman argues that what leads people to express one perspective or the other is not the amount of money they have, but whether they look upward or downward. Ursula, and others who said similar things, look up and compared themselves to those who earned much more, who had even more lavish lifestyles. Maya, an attorney turned stay-at-home mother, whose lawyer husband had an income of over $2 million, described her family as just fine, but not “really wealthy.” She said, “there are all the bankers that are heads and heels, you know, way above us” (33). Helen, with a similar household income said, “I feel like we’re somewhere in the middle, in the sense that there are so many people with so much money. They have private planes. They have drivers. . .” (33). So, even though the median income in New York City is $52,000, these people in the top one or two percent look up and feel in the middle. Penny, a legal consultant, and her husband, make a more than the households listed above, yet they talk much differently about their wealth. Like Karen and Keith, Penny looks down. “You know, there’s always someone in New York, especially New York City, Manhattan—who has more than you do. And there’s always a lot of people who have less. … I would say we’re on the higher end of having more.” If one only compares oneself with those above it understandably leads to a different self-perception than those who look down as well. The deeper question, the aspect of the chapter that caught my attention, is this: what leads some to look up and others to look down? The answer is simple and has profound implications for followers of Jesus. In essence, those who compare themselves upwards do so because they only socialize with people of similar or more economic means. They did not have relationships with people below them. “Those who faced downward tended to talk about friends, acquaintances, and colleagues in a wide range of economic circumstances” (49). Whether through family, workplace, organizations, or public schools, these people had cross-class relationships. It is not just the contrast between calling themselves middle class or affluent. The actions, attitudes, beliefs, and perspectives of the two groups differ in various ways. As Sherman quotes and describes the people it becomes clear that who you relate with will influence you. Who you hang out with, who you eat with, who you play with, who you serve with, who you interact with matters. This is true for all of us, not just the wealthy in Sherman’s book. And, it is true of both groups in her book--not just those who befriend people different than themselves. Our actions and attitudes will be influenced by who we relate to. The chapter led me to think about Galatians and table fellowship. In contrast to the society around them, Christians came together at one table–Jew and Greek, slave and free, male and female. I have thought of this as something that, through the transformative work of Jesus, we are able to do. With the people in Sherman’s chapter in mind, I had the thought: perhaps there is more imperative in that table fellowship than I had thought. Not just that through Christ Christians can sit down and eat with people who do not commonly eat together in our society, but that we are called to do so. Not just because it presents a beautiful picture of the fruit of the radical work of Jesus, but because it matters who we eat with, who we relate with. It will change us. Like the people in Sherman’s book, it will impact our empathy, actions, and attitudes. I discussed Sherman’s chapter with my friend and New Testament scholar, Ryan Schellenberg. I asked, “What do you think of that interpretation of Galatians?” He affirmed it, and suggested I think about Luke 14. Jesus says when you host a meal don’t invite those from your own status circles, “but when you give a banquet, invite the poor, the crippled, the lame, and the blind” (Luke 14:13). Then he tells the parable of a host who ends up doing just that. Certainly this is a pro-poor, pro-marginalized command—give them a seat at the table! But through the lens of Sherman’s interviews we can see that Jesus gave the command thinking of the rich as well. Who we eat with, who we relate with matters. It will change us. I recently had lunch with Anthony—just a few weeks after his release from prison. Four years ago, on his 36th birthday, he sadly shared during a jail Bible study that he has been in and out of jail and prison so much that he only had two birthdays for which he was not incarcerated since he was 17. Shortly before that birthday, however, Anthony had repented, had profound experiences of God’s loving forgiveness, and the transformative work of the Spirit was evident in his life. Of all the men who have been in my jail Bible study over the last ten years, Anthony is one of a handful I have corresponded with when they went to prison. Why? A special connection? A sense of great potential he has? A depth of sincerity? I am not totally sure, but I knew I took initiative to eat with him that day because I wanted to do whatever I could in the limited time I have to support him in his efforts to leave old ways behind. A good thing to do. I assumed I would continue to get together with him from time to time in the future. Reading Sherman’s chapter, however, left me with a desire to deepen my relationship with Anthony, not just for his benefit, but mine. I will be changed by friendship with Anthony. I could easily respond to Sherman’s chapter by patting myself on the back and listing all the relationships I already have with people unlike myself. I could also paint a very different picture by listing how much of my time I spend with people very similar to myself. In any case I do not think Jesus or Paul had a quota in mind—neither in the number of relationships nor in the amount of life transformation that flows from those relationships. Let us extend the table. It matters who we eat with, who we relate with. It will change our perspectives, attitudes, and actions in ways that will benefit us and others. I invite you to join me in making a commitment to seek out a new relationship or deepen a current relationship with someone significantly different than yourself—from a different social or economic class, different ethnically, different politically, different theologically, different life experience, etc. Who might it be? It matters. It will change you. Posted on August 28, 2018 by Mark Baker. The war in Vietnam spanned my childhood. It ended April 30, 1975, less than two months before I graduated from high school. Thus, watching Ken Burns’s and Lynn Novick’s documentary series, The Vietnam War, differed from seeing documentaries on other wars. I have lived experience, memories, of what it covered. I remember not just events, but also my understandings, perceptions, and feelings. In some ways the series peeled back layers and revealed to me how reality was so different than what I perceived. Yet it also helped me understand why I had the thoughts and feelings I did at the time. Numerous times I have told people the following: “On the evening news they had charts listing the killed and wounded on each side. Since there were not fronts in Vietnam, like the wars I read about in books, the body count was what I used to discern who was winning. We almost always won the numbers war on the evening news.” Looking back, I have thought of this as a child’s simplistic view of things. It was not. Body counts were the means of measuring progress in the war, not just for the little boy Mark Baker, but also for the Secretary of Defense. This focus on numbers and the negative implications flowing from that continued long after McNamara left the Department of Defense. For the U. S., it was a war of numbers. Patrols were sent out not to take territory from the enemy, but to attract fire and engage in a firefight to kill the enemy. U. S. soldiers would fight to drive the enemy off a hill, leave, the enemy would come back, and they would do it again. It was not the hill that mattered, it was the body count. The focus on numbers trickled down to the soldiers; they felt it. So, from privates on up, the way to impress those above you was getting numbers. That encouraged erring on side of killing innocent people rather than the opposite. It fostered lying and fabricating numbers. One pilot told about how the person looking at the pictures of what they had bombed always came up with ways to find things to count and to make them sound impressive—any building or vehicle damaged was turned into a success against something of military significance. I wonder where else we are pulled away from what is truly important because it can’t be quantified and measured? How does it happen in education, ministry, business, social work, etc.? This is not to say that measuring is totally wrong. For instance, if the number of people viewing my blogs drop dramatically, reflecting on why might be beneficial. But if I became too focused on numbers I would be pulled away from what is important. For some on the internet, all that matters are numbers. They focus their energy on discerning the best click bait. All they care about is quantity. It reminds me of what I say in class. “Machines are pure technique, but much of life is becoming machine-like. Values which humans are told to honor and to live by are the values of the machine: organization, standardization, precision, rationalization, systematization, efficiency, and artificiality. And other values are to be despised, as destructive of efficiency: individuality, spontaneity, variety, diversity, the natural, freedom, and subjectivity. As in so much else, here too let us center on Jesus. First, Jesus offers a model of focusing on the truly important. Second, the loving embrace of Jesus provides a place of security from the shaming voices that scold us for not quantifying more, for not prioritizing efficiency and the “success” it produces. Posted on July 3, 2018 by Mark Baker. What compels us to do the right thing? In the more individualistic West, the answer would be: one’s conscience. In most of the rest of the world, it is the collective, the group. The evaluative gaze of others compels right behavior. In the first I do the right thing to avoid internal feelings of guilt; in the latter I do the right thing to gain honor and to avoid the shaming of my group, my family, and myself. In our recent book, Ministering in Honor-Shame Cultures, Jayson Georges and I provide insights and tools for evangelism and discipleship in contexts that have a collectivist orientation. We give numerous examples of mistakes, including our own, that flow from a focus on the individual conscience in an honor-shame context. Yet, even in the West, to only focus on the individual conscience is problematic; it is an error to ignore the honor-shame dynamic even in individualistic contexts. Here too, communities and peer groups become courts of reputation. Although forming an individual to think correctly about Christian ethics is of fundamental importance in the individualistic West, that alone will not lead people to do the right thing. I recently heard a person talk of turning his conscience off so it would not bark at him saying, “You’re doing a bad and evil thing.” Why was the ethical direction from his conscience not enough? What pushed him to turn it off? What implications does this have for the church? As you read this story of a Vietnam war draftee, note the presence of both the individual conscience and the honor-shame dynamic. O’Brien thought then, and thinks now, that the better option, the “right” thing to do was go to Canada rather stay in the army and go to Vietnam. Regardless of whether you agree or disagree with what he considered right, let’s reflect on the dynamics of the decision itself. The honor-shame dynamic of a small tight knit town overpowered his individual thinking on the matter. He opted to do what the town would consider the honorable thing to do in order to avoid the shame of people talking about him in a disparaging way. What did he need? What might have led to a different outcome? He needed a counter community with a different honor code. He needed voices that would honor his decision to desert and neutralize the shaming voices of others in the court of reputation. Let’s think of this in an analogous way. Imagine in a ministry setting you work hard to shape someone’s beliefs about a particular ethical stance that differs from mainstream society. They are convinced. Then, however, like O’Brien they are alone with only their individual conviction, they are surrounded by people and media pressing them to do the opposite. Individual conviction may be enough, but it very well may not be. Such events place a recovering gang member in a difficult position. According to the moral logic of the street, a “good brother” defends the honor of his fallen kin by avenging his death with “payback.” And indeed the offers for assistance in “making things right” came swiftly from Roberto’s former associates. But just as quickly came the support and reminders of his new “brothers in Christ.” “Violence only begets more violence,” his pastor told him. “That’s no way to respond.” Roberto decided not to seek out vengeance and to relinquish his “right” to kill his brother’s killers (Ministering in Honor-Shame Cultures, 225). Although not as dramatic, my friend with a position in a large big-city law-firm probably felt as much pressure to do the obvious thing and continue putting in the hours so he could become a partner and earn an immense amount of money. Yet, with encouraging voices from fellow Christians he did what his peers and others in society considered ludicrous. He quit his position and went to work for a small firm in a small city in order to have more time for his family, for ministry, and for other activities. The value and importance of a church community honoring an individual’s Jesus-like actions is not just in relation to big and dramatic decisions, but in daily actions and decisions. I think of my friend Mario in Honduras. I once asked him how it was that he lived in ways so differently than other men and resisted the dynamics of machoness. He first affirmed how strong the honor code of machismo is. For instance, one aspect of machismo is drinking. A commonly heard saying is “One who does not drink is not a complete man.” In his teen years his friends started pressuring him to “be a man” and drink. He already felt shame for being poor, so to avoid more shame he began to drink. Some years later [after another night of drunken brawling]. . . he started attending church and five meetings later accepted Jesus as his Savior. . . As Mario reflected on how he was able to step away from the ways of machismo. He mentioned three things. A man from the church, Hector, spent a lot of time with him offering support and affirmation. Secondly, the Christian men at work and the people at the church provided a counter chorus. Just as friends had shamed him into drinking, old friends around him began ridiculing him and shaming him for becoming a Christian; they pressured him to continue in his macho ways. Christians countered these shaming comments of Mario’s friends by praising him for his efforts to stop drinking. Lastly, as his new identity as a loved child of God grew he felt increasing security to step away from other aspects of the machismo honor code and walk in the ways of the honor code of the New Testament. His church continued to affirm and honor him as he took these steps. The shaming comments of other men did not stop, but they do not have the power over him that they used to (Ministering in Honor-Shame Cultures, 223-24). How might your community more actively support and honor those who seek to go against the current and live according to the ways of the Kingdom of God? I encourage you to pray and ask God’s Spirit to give you a heightened awareness for opportunities to honor others, an imagination for how to, and the initiative to do so. Let us become active members of an alternative court of reputation. Posted on May 12, 2018 by Mark Baker. When showing the documentary Fresh in class one of the lines that always catches students’ attention is Joel Salatin talking about the chickenness of the chickens. He describes how his way of farming, in contrast to industrial chicken farms, honors the chickenness of chickens. In class discussion I assert that it is a theological statement, and that Salatin means it to be—even if he does not state that in the documentary. He affirms my assumption in his recent book, The Marvelous Pigness of Pigs: Respecting and Caring for all of God’s Creation. I immediately heard the phrase as theological because in my ethics class I so frequently talk about living more authentically as the people God created us to be. Christian ethics, in part, is about helping the Markness of Mark flourish. In this book Salatin states that to farm in a way that respects the pigness of pigs or the chickenness of chickens is to honor their creator. It also, he maintains, is the best way to farm. It is a stance of worship and respect, but also practical wisdom. He encourages us to pay attention to the patterns of creation and work with them for the good of pigs, chickens, fields and forests, and our good as well. Salatin describes himself as a “Christian libertarian environmentalist capitalist lunatic farmer” (xiii). One thing that means is that very few people will agree with everything in this book. More significantly it means that Salatin crosses more divides and has more diversity of friendships than many in today’s increasingly siloed society. He has many conservative Christians friends who worship the Creator and many liberal friends who worship creation. “This book has grown out of the tension between those two camps” (xiii). It is an attempt to persuade evangelicals to embrace, for biblical and theological reasons, the type of farming and earth-care practiced by Salatin and his friends in the other camp. There are many ways to read the book. Read it to learn about Salatin’s approach to sustainable farming, and ways non-farmers can participate in that approach. Read it for help in thinking of ways to talk about these issues to people you know in his target audience. Or, better yet, read it together with some in that camp. Read it for new biblical and theological insights produced by his thinking theologically about his farming practices. I encourage you to read it and let it challenge you broadly and deeply—not just in relation to specific actions and thoughts. As he works to show the contrast between the order and patterns of God’s creation, and the ways of industrial agricultural I found myself reflecting broadly and deeply on agriculture and beyond. I will share a few examples. In the mid-1800’s Louis Pasteur saw bacteria through a microscope and developed germ theory to explain illnesses. “He proposed ways to kill these critters. He saw nature as fundamentally flawed and in need of human intervention and fixing” (60). A contemporary of his, Antoine Beauchamp, saw the same things through a microscope, but came to a different conclusion. He developed terrain theory, arguing that there are good bacteria and bad, and it is the condition of the terrain that determines which wins out. Pasteur and his followers looked for ways to kill the germs. Beauchamp explored broadly. He studied the impact of things like sleep deprivation, hygiene, and food quality on the terrain. He looked for ways to have a wellness-inducing terrain where the good bugs would win out over the bad. After introducing these contrasting approaches Salatin spends the rest of the chapter describing how the two approaches play out. Do we take a more passive, victim mentality about sin—a sin gene or the devil made me do it; or, do we work at the terrain of our lives? Urbanization, without refrigeration or indoor plumbing set up a very negative terrain. “From smoke-clogged homes to manure-clogged streets to brewery-waste-fed-cows, the recipe for disease could not have been better” (62). Milk started making people sick. The solution? Germ theory says, kill the germs in the milk—pasteurization (which also kills the good bacteria). But Salatin points out, “raw milk from grazing cows doesn’t need to be fixed with pasteurization. It’s not broken” (63). Solution, clean up the mess and respect the cowness of cows—let them eat what cows naturally eat. “At sustainable agricultural conferences, most of the workshops are positive how-tos. I almost never hear much discussion of sickness and disease. . . At industrial agricultural conferences . . . nearly all the discussions center around diseases and sicknesses. The overriding desire is how to beat nature, how to win, as if nature is the enemy that must be subjugated like a military conquest” (89). I can applaud Salatin’s points, yet as I take a step back I have to acknowledge that I have been immersed in a germ-theory-world for most of my life. How does this influence me? How does a find-the-cause-of-the-problem-and-kill-it approach play out in other areas of my life? Germ-theory-mentality combined with industrial agriculture has produced a food system saturated with fear. Consumers fear contaminated foods and farmers fear disease or pests wiping them out. In response we seek to wrap ourselves in a sanitized bubble—sanitize food, keep out visitors who might carry a germ into a chicken farm, and use chemicals to kill malicious bugs that are present. “A farm of faith says this: if I follow the Creator’s patterns, immunity and wellness will follow.” Salatin is not naïve. He acknowledges that industrial mono-crop farmers have reason to be fearful, and consumers understandably want their milk pasteurized and their chickens dipped in bleach. They have reason to be fearful of the products of a mono-cultural industrial system. Jacques Ellul tolds us that technique always leads us to look for new techniques to solve the problems created by technique. Salatin does what Ellul advocates instead, dig deeper, look for root problems, and trust God and God’s ways not technique. What are other areas in our lives where fear pervades and we have not looked deep enough in search of freedom from our fears? Posted on May 4, 2018 by Mark Baker.